This is a scalable context timeline. It contains events related to the event November 12, 1996: Vancouver Abortion Provider Shot at Home. You can narrow or broaden the context of this timeline by adjusting the zoom level. The lower the scale, the more relevant the items on average will be, while the higher the scale, the less relevant the items, on average, will be. Confession and Conviction - Kopp will be extradited over a year later (see June 5, 2002 and After). He will confess to the murder shortly afterward (see November 21, 2002) and will be pronounced guilty in 2003 (see March 17-18, 2003). 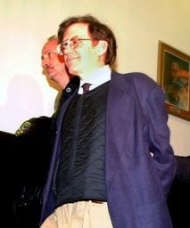 Accused murderer James Kopp, an anti-abortion advocate who allegedly shot Dr. Barnett Slepian (see October 23, 1998), is extradited by French authorities (see March 29, 2001) to the US after the American government assures them that Kopp will not face the death penalty. French law precludes suspects being extradited to foreign nations if the possibility exists that they will be executed. Kopp retains lawyer Paul Cambria to defend him, but also retains lawyer Bruce Barket because Barket, like Kopp, has strong anti-abortion views and wants to make the defense about abortion (Cambria wants to defend Kopp strictly on the evidence). Barket will not be allowed to represent Kopp in federal court. [National Abortion Federation, 2010] Months later, Kopp will confess to the murder (see November 21, 2002). He will be found guilty several months later (see March 17-18, 2003). Kopp Will Be Found Guilty - Kopp will be found guilty of Slepian’s murder (see March 17-18, 2003).